Solid hardwood floors have been around for a long time. They are generally ¾” thick and can be purchased raw or pre-finished. Because each plank is made from a single piece of wood, it tends to be very expensive. In addition, solid wood floors expand and contract with changes in temperature and humidity. Running a dehumidifier in the summer and a humidifier in the winter can minimize these gaps. Board width significantly impacts how a hardwood floor will look in the home. 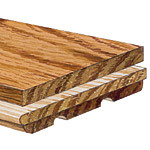 Hardwood floors are traditionally milled in narrow strips 2 ¼” wide with random lengths. Or, hardwood can be milled into wider “planks” of 3”, 4” or 5” width with random lengths. The boards fit flush against each other for a smooth, traditional look. Features a slight angle at the top edge, giving some definition to each plank. You can feel the edge when you walk over the floor. It also helps mask slight imperfections in the floor. Features a more significant bevel along the edge, resulting in pronounced joints between the planks, adding more depth and dimension, creating a hand-crafted look. A disadvantage is that the edge captures dirt. Multi-layer, cross grain constructed hardwood, sometimes referred to as “engineered” hardwood, is becoming more and more popular. Engineered Hardwood is constructed by taking multiple layers of hardwood and fusing them together at perpendicular angles to create a stronger, more stable hardwood. It is constructed of a face or wear layer (made from the species that defines the look of the hardwood), a core layer and a back. Each layer is made from solid hardwood and fused together. Some lesser quality engineered hardwood is made with three layers of hardwood, versus the five layers found in better quality flooring. Each layer substantially increases the product’s stability. The term “engineered” is misleading, because it implies that the wood is not real. In fact, many people mistakenly think that engineered hardwood is laminate. Engineered hardwood is 100% real wood. Multi-layer, cross grain constructed hardwood is gaining popularity because it is more stable than solid hardwood, which means the wood is less likely to expand and contract with changes in temperature. The increased stability also means that engineered hardwood can be installed on floors that are below grade or on concrete, something you wouldn’t do with solid hardwood. Buyer’s Tip: Not all hardwoods are created equal. Lesser quality hardwoods are not milled to the same tolerance as better quality hardwoods. The result is planks that are not square or may have different heights, resulting in unsightly gaps between the planks when installed. Also, when looking at engineered hardwood the cutting method of wood can affect how the graining of the floor looks. Engineered floors use one of two cutting processes. 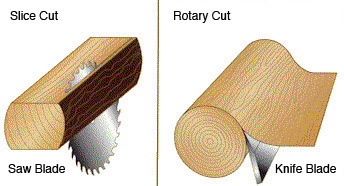 “Sliced Cut” shows a more uniform pattern (solid ¾” hardwood floors are slice cut) whereas “Rotary Cut” displays a larger and bolder graining pattern. Low gloss and semi gloss finishes are less likely to show minor scratches and scuff marks.